...pull this thread as I walk away. Well, it's not always that easy. Unraveling a sweater to your liking involves a little more patience than that. I call it 'Precision Unraveling'. I'll show you how to use fuzzy holes, runs, and zigzagging threads to add interest to an otherwise boring sweater. Knit sweater. Preferably one that's been naughty. Seam ripper or small scissors (nail scissors will work). Too-Small Sweaters: Destroying a sweater can lend it a looser knit. This means a sweater that has shrunk in the wash can be salvaged. Shrunken sweaters often hike themselves up, becoming creepy little belly sweaters. A sweater that once covered your hips nicely could shrink over time to barely cover your navel. Check out the length on my sweater before and after I distressed it. Layering and Color: I'm as Irish as the next lass, so I love me some green. But the eye-buzzing green of this sweater was just too much. After unraveling, you can see that the minty green color is nicely broken up by the brown cami underneath. Destroyed and loose-knit sweaters are an easy option for layering. (Need more help layering? Check out my Guide to Layering Clothes). 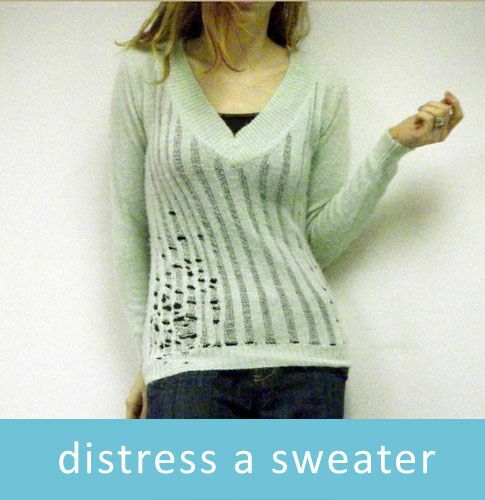 A Torn Sweater: A snag isn't such a big deal after you've camouflaged that cardigan with some precision unraveling. Nobody has to know! (Want to fix it instead? See How to Darn a Sweater). My dad always told me not to pick. Well, in this case, I think it's okay. Take a good look at your sweater. You'll notice that there are lots of little 'v' shapes, arranged in rows and columns. These are the stitches. Insert your seam ripper in two stitches that are in the same row. If you are using small scissors (like nail scissors), insert one blade into the stitches. Snip. To create exactly the look you want, you are going to pop the seams as shown above. Gently pull at the hole you've made. You'll see a couple of stitch 'heads' that are willing to retreat away from the threads that stretch across the hole. Pull at the threads. As you pull, the stitches will unravel, and you'll be left with sparse lines of thread. If the stitches get stuck and refuse to move, there is probably some fuzz caught up in them. Pick at the heads of the stitches until they come loose. Then you can resume pulling on the threads. To keep from looking like you just got in an alley fight, figure out a pattern you want on your sweater and stick to it. I chose stripes with a speckling of small holes toward the bottom of the sweater. For perfect stripes, start by making a hole at the bottom or top of the sweater. Pop the same few seams (as shown in the previous step) all the way from top to bottom of the sweater. This process takes a little while, so cozy up in front of the TV and un-knit. Need some more character? Try creating tiny holes and stripes..
Little holes along stripes of unraveled material can give a sweater a rougher look. Start by cutting a small hole, then unravel the treads at least 2" away from the hole. Cut another hole at this point and repeat. The key is to not cut the holes too close together... you don't want to accidentally join them into one big hole. For scooting stitches, you need to do the opposite of our 'little holes and stripes' method. For this one, first make all of the holes you want in a column. They don't have to be in a perfect column, don't worry. Just make them at least 2" apart. Once all of the holes have been made, Take a look at the space between each hole. This is usually where we pop the seams. Here you can pop a couple, but leave the stitches mostly intact. From here, use your seam ripper (or the back of your scissor blade... not the sharp part) to push the stitches to the side, as shown in the photo above. Here is our finished sweater, after much harassment and due diligence. To get a better look at the seams you are working on, stretch the sweater out over the back of a chair. Alternately, you can wear a pair of dark pants and stretch the sweater over your knee. A seam ripper really is the right tool for the job, here. While small scissors can be used in a pinch, you may end up accidentally snipping here and there. For sweaters that have cable knit or other designs, try to work around the design. I have seen some really cool destroyed sweaters with all but the cable knit unraveled. Already destroyed your sweater? That was quick. Upload a photo and tell us all about it. 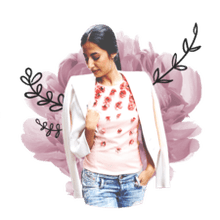 You could be featured in the next DIY Fashion blog or weekly newsletter.